PARADISE, Calif. (AP) — A dog named Kingston is back with his family 101 days after he jumped out of their truck as they fled a devastating Northern California wildfire. 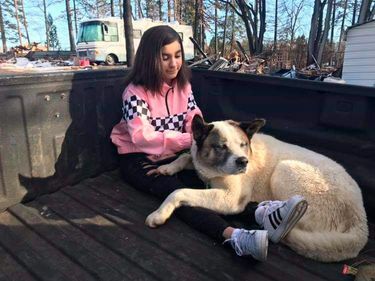 The 12-year-old Akita was reunited Monday with the Ballejos family, who fled the town of Paradise late last year, Sacramento television station KXTV reported . Ballejos said they never lost hope and kept posting flyers and contacting shelters. “Every night I would ask my dad and tell him that we needed to go look for him,” said Ballejos’ daughter, Maleah. The family got a call after animal rescue volunteer Ben Lepe trapped Kingston on Sunday and took him to Friends of Camp Fire Cats, a local rescue group. The volunteers saw a missing dog message on Facebook and contacted the family. Lepe said the large dog had been spotted on surveillance cameras and that he set up a trap big enough for it on Saturday. Family members believe Kingston survived by eating skunks, because he hunted them before the fire and smelled of skunk when they picked him up. The town of Paradise was leveled by a Nov. 8 blaze that killed 85 people and destroyed nearly 15,000 homes in the area. Angel Herrera, of Friends of Camp Fire Cats, said the group has rescued more than 200 lost pets since the fire and still sets traps. “If we had the resources, we could trap 50 animals every single night,” she said.